Tragus is a big High Street presence, but one lacking a cohesive and meaningful recruitment brand. Our creative team came up with this award-winning proposition and concept. Tragus is one of the UK’s largest independent restaurant groups. Trouble is, not many people know that. They know their brands – big name restaurant chains such as Café Rouge, Bella Italia and Strada – but not Tragus itself. So we were asked to make Tragus more upfront. We were also asked to bring its hero brands under the Tragus fold, but not to affect their individual identities. Our message was simple: Tragus is big and big is beautiful. 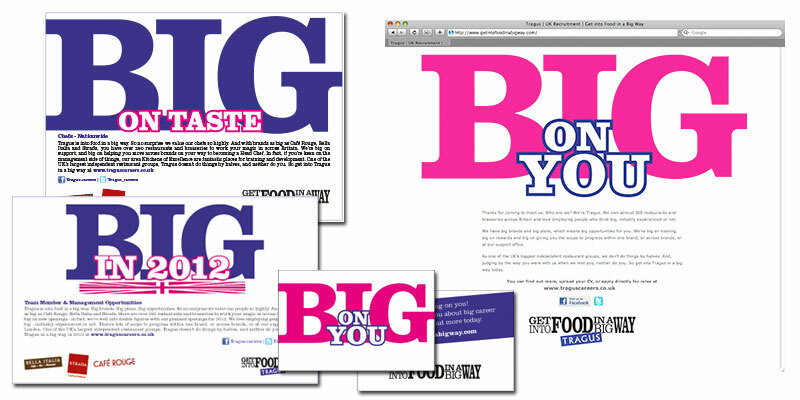 We constructed a Tragus stamp – ‘Get Into Food In A Big Way’ – and applied it like a branding iron across all our communications. We then built a website with a lot of white space, minimal copy and flash animation that brought big, bold Tragus facts to life. We put together a four-minute film and embedded it into the site, then created links across to new Café Rouge, Bella Italia and Strada sites, which we designed around their own brand identities while keeping tone of voice and content consistent with Tragus. Finally, we produced a suite of advertising and employee collateral even down to ‘poaching cards’ with the ‘Big On You’ as the linked message. We think it’s a very effective example of how to bring an employer ‘brand-behind-the-brands’ to the fore. So did the judges at the Grocery Advertising & Marketing Awards (Gramias) and Caterersearch.com website awards where the campaign picked up several gongs.